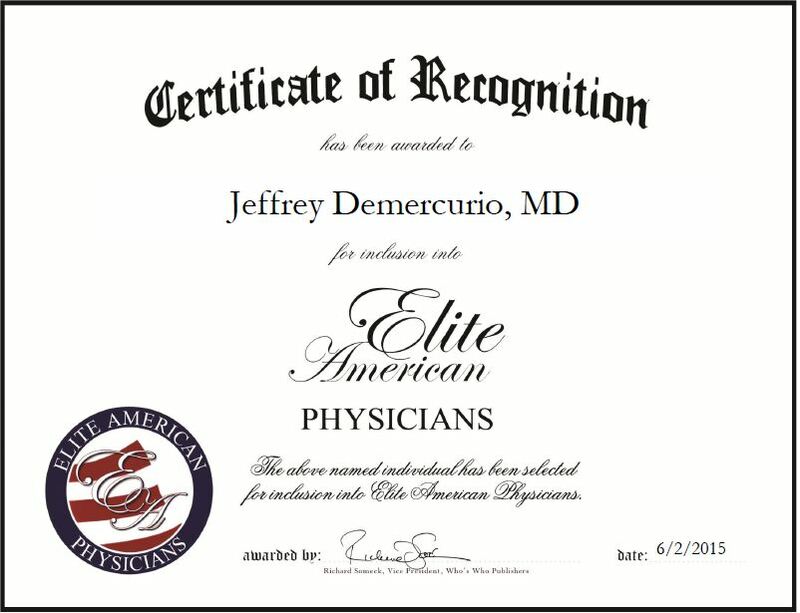 Dayton Beach, FL, June 2, 2015, Jeffrey Demercurio, MD, Physician at Halifax Health-Center for Plastic & Cosmetic Surgery, has been recognized by Elite American Physicians for dedication, achievement and leadership in facial and cosmetic surgery. Dr. Demercurio has always been interested in the sciences and both of his parents are a part of the medical field. He worked as a volunteer in a hospital during summers in college, and this inspired him to pursue a career in the field. Dr. Demercurio has been practicing medicine for 17 years and has been in his current position for the past six. Dr. Demercurio provides a range of cosmetic, plastic and reconstructive surgeries to patients. He is known for his experience and knowledge of complex facial and cosmetic surgery procedures, as well as breast augmentation. He also performs brow lifts, face lifts, eyelid surgery, arm reduction, chemical peels, rhinoplasty, liposuction and laser resurfacing. For his exceptional work, Dr. Demercurio was honored with the Patients’ Choice Award and Compassionate Doctor Recognition from 2012-2014. He earned an MD at Wayne State University and completed a general surgery residency at Detroit Medical Center. Dr. Demercurio attributes his success to going above and beyond to help educate patients regarding their procedures. Looking toward the future, Dr. Demercurio intends to experience the continued growth and success of his surgical practice. This entry was posted in Plastic Surgery and tagged breast augmentation, cosmetic surgery, face lifts, liposuction, rhinoplasty. Bookmark the permalink.